The Technical Committee of the Nigeria Football Federation on Tuesday postponed by one week the release of the provisional list of invited players for the 2014 World Cup. According to report, the Super Eagles’ Head Coach, Stephen Keshi, had on Tuesday submitted a 38-man list to the committee. After submitting it, Keshi refused to disclose the names of the invited players, urging newsmen to meet the NFF for the list. However, Paul Bassey, a member of the Technical Committee, told newsmen after their meeting that the decision to withhold the list was to allow for more consultations. 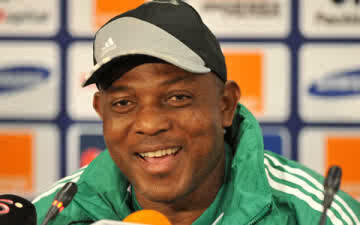 “We have decided to shelve the release of the list to give him (Keshi) some time for consultations. We are not in a hurry. We have not heard of any country releasing a team list by this time. “However, we took the opportunity to look at details of the programme, which was presented by the Technical Department, concerning preparations for the World Cup in Brazil. Among these are the camp site, personnel and all of that,” Bassey said. He however said a provisional list of 30 players would be submitted to FIFA on May 10, adding that it was from the list that the final 23 players would be selected by the coach. Bassey contended that the list, being circulated in certain sections of the media in the last one week, did not emanate from the NFF or Keshi. He said the list could only be authentic when it came from the Technical Committee of the federation or the Super Eagles’ Head Coach. “If we release this list in a hurry, it will look as if we are heating up the polity. But, be assured that when it is ready, we will give it to the media. “Most European leagues will end in about three weeks from now and Keshi is still studying some players, the number to invite and who to invite.